Cher (born Cherilyn Sarkisian; May 20, 1946) is an American singer and actress. Commonly referred to by the media as the Goddess of Pop, she has been described as embodying female autonomy in a male-dominated industry. She is known for her distinctive contralto singing voice and for having worked in numerous areas of entertainment, as well as adopting a variety of styles and appearances during her six-decade-long career. 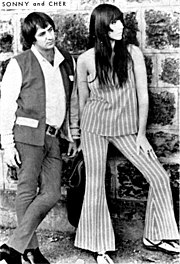 Cher gained popularity in 1965 as one-half of the folk rock husband-wife duo Sonny & Cher after their song "I Got You Babe" reached number one on the American and British charts. By the end of 1967, they had sold 40 million records worldwide and had become, according to Time magazine, rock's "it" couple. She began her solo career simultaneously, releasing in 1966 her first million-seller song, "Bang Bang (My Baby Shot Me Down)". She became a television personality in the 1970s with her shows The Sonny & Cher Comedy Hour, watched by over 30 million viewers weekly during its three-year run, and Cher. She emerged as a fashion trendsetter by wearing elaborate outfits on her television shows. For other uses, see Cher (disambiguation). In 1982, Cher made her Broadway debut in the play Come Back to the Five and Dime, Jimmy Dean, Jimmy Dean and starred in its film adaptation. She subsequently received critical acclaim for her performances in films such as Silkwood (1983), Mask (1985), The Witches of Eastwick (1987) and Moonstruck (1987), the latter of which earned her the Academy Award for Best Actress. She then revived her musical career by recording the rock-inflected albums Cher (1987), Heart of Stone (1989) and Love Hurts (1991), all of which yielded successful singles such as "I Found Someone", "If I Could Turn Back Time" and "Love and Understanding". 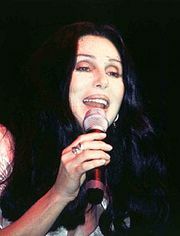 Cher reached a new commercial peak in 1998 with the album Believe, whose title track became the biggest-selling single of all time by a female artist in the UK. It features the pioneering use of Auto-Tune, also known as the "Cher effect". Her 2002–2005 Living Proof: The Farewell Tour became one of the highest-grossing concert tours of all time, earning $250 million. In 2008, she signed a $180 million deal to headline the Colosseum at Caesars Palace in Las Vegas for three years. In 2018, Cher returned to film for her first on-screen role since 2010's Burlesque, starring in the musical romantic comedy film Mamma Mia! Here We Go Again. Inspired by the film, the album Dancing Queen (2018) debuted at number three on the Billboard 200, tying with 2013's Closer to the Truth for Cher's highest-charting solo album in the U.S.
Cher has won a Grammy Award, an Emmy Award, an Academy Award, three Golden Globe Awards, a Cannes Film Festival Award, a special CFDA Fashion Award, and a Kennedy Center Honors prize, among several other honors. She has sold 100 million records worldwide to date, becoming one of the best-selling music artists in history. She is the only artist to date to have a number-one single on a Billboard chart in six consecutive decades, from the 1960s to the 2010s. Outside of her music and acting, she is noted for her political views, philanthropic endeavors, and social activism, including LGBT rights and HIV/AIDS prevention. Cher's 19th studio album Heart of Stone (1989) was certified triple platinum by the RIAA. The music video for its second single, "If I Could Turn Back Time", caused controversy due to Cher's performance on a Navy warship, straddling a cannon, and wearing a leather thong that revealed her tattooed buttocks. The song topped the Australian charts for seven weeks, reached number three on the Billboard Hot 100 chart and became one of Cher's most successful singles. Other songs from Heart of Stone to reach the U.S. top ten were "After All", a duet with Peter Cetera, and "Just Like Jesse James". At the 1989 People's Choice Awards, Cher won the Favorite All-Around Female Star Award. She embarked on the Heart of Stone Tour in 1990. Most critics liked the tour's nostalgic nature and admired Cher's showmanship. Its parent television special Cher at the Mirage (1991) was filmed during a concert in Las Vegas. Classic Cher, a two-year, 96-performance concert residency at both the Park Theater at Monte Carlo Resort and Casino, Las Vegas, and The Theater at MGM National Harbor, Washington, opened on February 2017. At the 2017 Billboard Music Awards, Cher performed "Believe" and "If I Could Turn Back Time", her first awards show performance in more than 15 years, and was presented with the Billboard Icon Award by Gwen Stefani, who called her "a role model for showing us how to be strong and true to ourselves [and] the definition of the word Icon." On March 4, 2018, Cher headlined the 40th Sydney Gay and Lesbian Mardi Gras. Tickets sold out within three hours after she hinted her performance on her Twitter account. On May 7, 2018, Cher announced the Here We Go Again Tour, which started on September 21, 2018, and is set to finish on May 18, 2019. She stated, "My visit to Sydney's Mardi Gras reminded me how unique and beautiful Australia is. It's been 13 years since I toured there so I thought 'let's do it one more time.'" Billboard's Keith Caulfield wrote that "There's divas, and then there's Cher." Dazed magazine's Shon Faye elaborates: "If Madonna and Lady Gaga and Kylie and Cyndi Lauper were playing football, Cher would be the stadium they played on, and the sun that shone down on them." According to Jeff Miers from The Buffalo News, "Her music has changed with the times over the decades, rather than changing those times through groundbreaking work"; however, he felt that subsequent female pop singers were heavily inspired by Cher's abilities to combine "showmanship with deep musicality ... to make valid statements in a wide variety of trend-driven idioms ... to ease effortlessly between pop subgenres [and] to shock without alienating her fans", as well as by her charismatic stage presence and the strong LGBT support among her fan base. Cher's work has influenced artists including Beyoncé, Bonnie McKee, Britney Spears, Christina Aguilera, Drew Barrymore, Garbage, Gwen Stefani, Jennifer Lopez, Marc Jacobs, Tina Turner, and Lady Gaga. Gaga studied Cher's performance in Moonstruck to play the role of Ally for the 2018 film A Star Is Born. Cher is commonly referred to by the media as the "Goddess of Pop." ↑ Nichelle Nichols and BarBara Luna in the TV series Star Trek episode "Mirror, Mirror" on October 6, 1967, and Diana Ewing in the episode "The Cloud Minders" of the same program on February 28, 1969. 1 2 3 Bellafante, Ginia (January 19, 1998). "Appreciation: The Sonny Side of Life". Time. Archived from the original on February 1, 2016. Retrieved January 16, 2016. 1 2 Berman 2001, p. 17. 1 2 3 4 Parish & Pitts 2003, p. 147. ↑ Berman 2001, pp. 17–18. 1 2 3 Berman 2001, p. 18. ↑ Bego 2001, p. 10. ↑ Cher & Coplon 1998, p. 39. 1 2 3 Berman 2001, p. 22. 1 2 3 Berman 2001, p. 21. 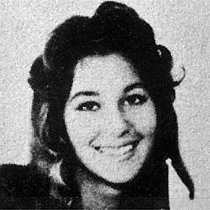 ↑ "Cheryl Lapiere, Born 05/20/1946 in California". California Birth Index. Archived from the original on January 31, 2016. Retrieved January 16, 2016. ↑ Berman 2001, p. 23. 1 2 Berman 2001, p. 24. ↑ Berman 2001, p. 27. 1 2 Berman 2001, p. 28. 1 2 3 4 5 6 7 8 Eder, Bruce. "Cher – Biography & History". AllMusic. Archived from the original on February 1, 2016. Retrieved January 16, 2016. ↑ "Cher divorces Sonny". Record-Journal. June 28, 1975. Retrieved April 24, 2016. ↑ Cher & Coplon 1998, p. 94. ↑ Bego 2001, pp. 29–30. 1 2 Caulfield, Keith (May 20, 2014). "Cher's 20 Biggest Billboard Hits". Billboard. Archived from the original on January 5, 2017. Retrieved January 16, 2016. ↑ Bego 2001, p. 40. ↑ "Cher – Awards". AllMusic. Archived from the original on February 1, 2016. Retrieved January 16, 2016. ↑ Sendra, Tim. "All I Really Want to Do – Cher – Songs, Reviews, redits". AllMusic. Archived from the original on January 28, 2016. Retrieved January 16, 2016. ↑ Cher & Coplon 1998, p. 98. ↑ Cher & Coplon 1998, pp. 108–109. 1 2 3 4 Wilson, Cintra (February 22, 2000). "Cher". Salon. Archived from the original on February 1, 2016. Retrieved January 16, 2016. ↑ Caulfield, Keith (August 14, 2015). "Rewinding the Charts: Fifty Years Ago, Sonny & Cher 'Got' to No. 1". Billboard. Archived from the original on February 1, 2016. Retrieved January 16, 2016. 1 2 "500 Greatest Songs of All Time". Rolling Stone. Archived from the original on January 2, 2015. Retrieved January 16, 2015. ↑ Cher & Coplon 1998, pp. 110–111. ↑ Cher & Coplon 1998, p. 114. 1 2 3 Parish & Pitts 2003, p. 149. ↑ Cher & Coplon 1998, p. 116. 1 2 Parish & Pitts 2003, p. 148. 1 2 Caulfield, Keith (October 2, 2013). "Cher Earns Highest-Charting Solo Album Ever on Billboard 200". Billboard. Archived from the original on January 17, 2016. Retrieved January 16, 2016. ↑ "Sonny & Cher – Chart history". Billboard. Archived from the original on January 31, 2016. Retrieved January 16, 2016. ↑ DeCaro, Frank (May 31, 1998). "Style Over Substance; Got You Babe: Cher Reclaims Her History". The New York Times. Archived from the original on February 7, 2016. Retrieved February 6, 2016. ↑ Bego 2001, pp. 45–54. 1 2 3 Berman 2001, p. 31. ↑ Cher & Coplon 1998, p. 134. 1 2 Brush, Stephanie (March 20, 1988). "Cher: Yes? No? (Check Only One)". The New York Times. Archived from the original on February 7, 2016. Retrieved January 16, 2016. 1 2 Bego 2001, pp. 55–56. ↑ Bego 2001, p. 54. 1 2 Bego 2001, pp. 58–59. ↑ Deming, Mark. "3614 Jackson Highway – Cher – Songs, Reviews, Credits". AllMusic. Archived from the original on January 28, 2016. Retrieved January 16, 2016. 1 2 Green, Michelle (August 5, 1991). "Sonny on Cher". People. Archived from the original on December 26, 2016. Retrieved January 16, 2016. 1 2 "Chaz Bono, Cher's child, becomes a man after Southern California judges grants gender change". Herald Sun. May 7, 2010. Retrieved January 16, 2016. ↑ Berman 2001, pp. 31–32. 1 2 3 Johnson, Anne Janette (2002). "Cher Facts, information, pictures". Encyclopedia.com. Archived from the original on December 26, 2016. Retrieved January 16, 2016. 1 2 Berman 2001, pp. 32–33. ↑ Berman 2001, p. 33. ↑ Berman 2001, pp. 33–34. 1 2 Erickson, Hal. "Cher – Biography, Movie Highlights and Photos". AllMovie. Archived from the original on February 11, 2016. Retrieved January 16, 2016. ↑ Mansour 2005, p. 450. ↑ Bego 2001, pp. 76–78. 1 2 Bego 2001, pp. 68–72. ↑ Rob Tannenbaum, Rob (May 19, 2017). "Cher's 'Gypsys, Tramps & Thieves': Why It's One of the 20th Century's Greatest Songs". Billboard. Archived from the original on July 26, 2017. Retrieved September 10, 2017. ↑ Bego 2001, p. 72. ↑ Bronson 1997, p. 301. ↑ Bego 2001, p. 81. 1 2 Bronson 1997, p. 345. ↑ Bego 2001, pp. 81–82. 1 2 Bronson 1997, p. 359. 1 2 3 4 5 6 7 8 9 "Gold & Platinum". Recording Industry Association of America. Archived from the original on February 12, 2018. Retrieved January 16, 2016. ↑ Kirsch, Bob (November 17, 1974). "Top Album Picks". Billboard. Retrieved January 16, 2016. ↑ Larkin 2011, p. 2999. 1 2 3 4 5 6 7 8 Danza, Johnny; Ferguson, Dean. "Cher: Back To The Dance Floor!". About.com. Archived from the original on September 18, 2005. ↑ "On the Record". People. May 11, 1998. Archived from the original on December 26, 2016. Retrieved January 17, 2016. 1 2 3 Berman 2001, p. 35. ↑ Bono 1992, p. 4. 1 2 "Cher". Hollywood Foreign Press Association. Archived from the original on December 26, 2015. Retrieved January 17, 2016. ↑ Hyatt 2003, p. 231. ↑ Higgins, Bill (November 2, 2012). "How David Geffen Romanced Cher and Built a Music Empire". The Hollywood Reporter. Archived from the original on January 21, 2016. Retrieved January 17, 2016. 1 2 Crampton & Rees 1999, p. 194. 1 2 Bego 2001, pp. 97–98. ↑ Berman 2001, p. 41. ↑ Bego 2001, p. 101. ↑ Berman 2001, p. 36. 1 2 Bego 2001, p. 102. 1 2 Lonergan & Studwell 1999, p. 208. ↑ Bego 2001, p. 105. ↑ "Cher marries Greg Allman – Jun 30, 1975". History. Archived from the original on January 6, 2016. Retrieved January 17, 2016. 1 2 Cagle, Jess (July 10, 1992). 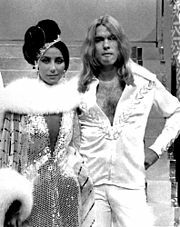 "Gregg Allman and Cher's troubled marriage". Entertainment Weekly. Archived from the original on November 17, 2015. Retrieved January 17, 2016. ↑ Berman 2001, p. 42. 1 2 Hochman 1999, p. 1004. ↑ Parish & Pitts 2003, p. 150. ↑ Cherry, Rona. "Toying With a Name". ↑ Bego 2001, p. 116. ↑ "Gregg Allman – Songwriter, Singer". Biography.com. Archived from the original on January 31, 2016. Retrieved January 17, 2016. ↑ Armstrong, Lois (April 10, 1978). "Cher's New Flame". People. Archived from the original on December 26, 2016. Retrieved January 18, 2016. ↑ "Rock On!". People. August 18, 1980. Archived from the original on December 26, 2016. Retrieved January 18, 2016. ↑ Armstrong, Lois (October 22, 1979). "Cher's Life With Gene". People. Archived from the original on December 26, 2016. Retrieved January 18, 2016. ↑ Stevens, Heidi (July 20, 2002). "Turning Back Time". Chicago Tribune. Archived from the original on November 5, 2012. Retrieved January 17, 2016. ↑ Bego 2001, p. 119. ↑ Bego 2001, p. 133. 1 2 3 4 Berman 2001, p. 44. ↑ Bego 2001, p. 124. ↑ Berman 2001, p. 45. 1 2 Berman 2001, pp. 45–46. ↑ Bego 2001, p. 272. ↑ Bego 2001, p. 139. ↑ Berman 2001, pp. 46–47. ↑ Berman 2001, p. 47. ↑ "Picks and Pans Review: Cher ... a Celebration at Caesars". People. April 4, 1983. Archived from the original on December 26, 2016. Retrieved March 9, 2016. ↑ Bego 2001, p. 143. ↑ Guarisco, Donald A. "Dead Ringer for Love – Meat Loaf – Song Info". AllMusic. Archived from the original on January 26, 2016. Retrieved January 17, 2016. ↑ Bego 2001, p. 159. 1 2 Berman 2001, p. 49. 1 2 3 4 5 6 7 8 9 Parish & Pitts 2003, p. 151. ↑ Zuckoff 2009, p. 431. ↑ Berman 2001, p. 54. 1 2 Sessums, Kevin (October 31, 1990). "Cher: Starred and Feathered". Vanity Fair. Archived from the original on January 13, 2016. Retrieved January 17, 2016. ↑ "Mask (1985) – Weekend Box Office Results". Box Office Mojo. Archived from the original on December 28, 2015. Retrieved January 17, 2016. ↑ Hassan, Genevieve (March 18, 2010). "Talking Shop: Designer Bob Mackie". BBC News. Archived from the original on January 31, 2016. Retrieved January 17, 2016. ↑ Hall, Jane (July 14, 1986). "Late Night Letterman". People. Retrieved January 4, 2019. ↑ Greene, Andy (May 6, 2015). "David Letterman's Top 10 Musical Moments". Rolling Stone. Retrieved January 4, 2019. 1 2 Mansour 2005, p. 82. ↑ "1987 Yearly Box Office Results". Box Office Mojo. Archived from the original on March 7, 2016. Retrieved March 14, 2016. ↑ Maslin, Janet (December 16, 1987). "Film: 'Moonstruck,' With Italians in Love". The New York Times. ↑ Bego 2001, pp. 213. ↑ Berman 2001, pp. 68–72. 1 2 "This Week In ... 1989". ARIA Music News. Archived from the original on November 14, 2015. 1 2 Roedy 2011, p. 87. 1 2 Semonche 2007, p. 161. ↑ Bego 2001, p. 217. ↑ "And the 15th Annual People's Choice for "Favorite All Around Female Star" is ... Cher!". CBS. Archived from the original on December 22, 2015. 1 2 O'Connor, John J. (February 4, 1991). "Review/Television; A Potpourri Of Cher's Mood Swings". The New York Times. Archived from the original on January 27, 2016. Retrieved January 17, 2016. ↑ Berman 2001, p. 67. 1 2 3 4 Kennedy, Dana (May 31, 1996). "Cher plots her next comeback". Entertainment Weekly. Archived from the original on February 24, 2016. Retrieved January 17, 2016. ↑ Berman 2001, pp. 69–71. ↑ Bego 2001, p. 228. ↑ Mansfield, Brian. "Mermaids – Original Soundtrack – Songs, Reviews, Credits". AllMusic. Archived from the original on February 1, 2016. Retrieved January 17, 2016. 1 2 3 4 5 "Cher – full Official Chart History". Official Charts Company. Archived from the original on January 2, 2016. Retrieved January 17, 2016. 1 2 3 Bessman, Jim (May 18, 1996). "Cher Changes Approach For Her 'Man's World' On Reprise". Billboard. Retrieved January 16, 2016. ↑ Bego 2001, p. 231. 1 2 Parish & Pitts 2003, p. 152. ↑ Bego 2001, p. 234. ↑ Promis, Jose F. "Greatest Hits: 1965–1992 – Cher – Songs, Reviews, Credits". AllMusic. Archived from the original on February 1, 2016. Retrieved January 17, 2016. ↑ Berman 2001, p. 71. ↑ Sonneborn 2002, p. 40. 1 2 Berman 2001, p. 73. 1 2 Murphy, Ryan (May 30, 1994). "The Beat Doesn't Go On: Where The Heck Is Cher?". Orlando Sentinel. Archived from the original on February 1, 2016. Retrieved January 17, 2016. ↑ Bego 2001, p. 238. ↑ Murphy, Ryan (May 21, 1993). "Cher: Is her movie career dead?". Entertainment Weekly. Archived from the original on January 20, 2016. Retrieved January 17, 2016. ↑ Bego 2001, p. 256. ↑ Bego 2001, p. 253. ↑ Bronson, Fred (April 1, 1995). "Chart Beat: 2Pac Finally Wins 'Against The World'". Billboard. Retrieved January 17, 2016. 1 2 Berman 2001, p. 82. 1 2 3 Holden, Stephen (June 30, 1996). "Queen of the Comeback, Cher Tries Yet Again". The New York Times. Archived from the original on November 18, 2015. Retrieved January 17, 2016. ↑ Flick, Larry (May 11, 1996). "Dance Trax: Daphne Gets New Lease On Her Career With 'Rent'". Billboard. Retrieved February 13, 2016. ↑ Bego 2001, p. 259. ↑ Berman 2001, pp. 83–84. ↑ Maslin, Janet (April 3, 1996). "Faithful (1996) – Film Review; A Feuding Couple Relies On Hit-Man Diplomacy". The New York Times. Archived from the original on January 5, 2017. Retrieved February 2, 2016. ↑ Bernstein, Paula (March 7, 2000). "HBO climbing another 'Walls'". Variety. Archived from the original on February 6, 2016. Retrieved February 5, 2016. ↑ Carter, Bill (April 12, 2000). "TV Notes; Going Out Blazing". The New York Times. Archived from the original on May 27, 2015. Retrieved February 5, 2016. ↑ Negra 2001, pp. 176–177. ↑ Carter, Chris (2005). Audio Commentary for "The Post-Modern Prometheus" (DVD). The X-Files: The Complete Fifth Season: 20th Century Fox Home Entertainment. ↑ Deans, Meghan (August 23, 2012). "Reopening The X-Files – 'The Post-Modern Prometheus'". Tor.com. Archived from the original on March 28, 2016. Retrieved January 17, 2016. 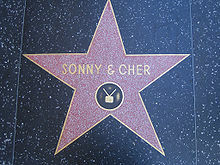 ↑ "Tearful Cher remembers Sonny's wit, tenacity". Lawrence Journal-World. January 10, 1998. Retrieved January 17, 2016. ↑ Bego 2001, p. 281. 1 2 "Sonny & Cher". Hollywood Walk of Fame. Archived from the original on March 8, 2016. Retrieved January 17, 2016. ↑ Berman 2001, p. 90. ↑ Berman 2001, p. 91. ↑ Bego 2001, p. 283. ↑ "Cher Says 'Farewell' With 50-City Tour". Billboard. May 1, 2002. Archived from the original on April 22, 2016. Retrieved July 8, 2016. 1 2 "Global music taste revealed in BBC World Service poll" (Press release). BBC. December 20, 2002. Archived from the original on December 17, 2016. Retrieved January 17, 2016. ↑ Ahmed, Insanul (August 5, 2010). "Complex Presents: The 25 Greatest Auto-Tune Songs". Complex. Archived from the original on January 31, 2016. Retrieved January 17, 2016. 1 2 Hay, Carla (February 5, 2000). "Backstreets, Cher, TLC Among Those Up For Record of the Year". Billboard. Retrieved January 17, 2016. ↑ Berman 2001, p. 13. ↑ "Official Charts Flashback 1998: Cher – Believe". Official Charts Company. October 25, 2018. Retrieved November 3, 2018. 1 2 "Billboard Chart Record-Breakers: The Longest Music Moments Ever". Billboard. May 9, 2014. Archived from the original on January 20, 2016. Retrieved January 18, 2016. ↑ Paoletta, Michael (December 25, 1999). "If Labels 'Believe' In Dance Acts, Success Will Follow". Billboard. Retrieved February 6, 2016. ↑ Taylor, Chuck. "The Billboard Hot 100 Songs of the Year (1990–1999)". Billboard. Archived from the original on April 13, 2012. ↑ Wilker, Deborah (January 28, 1999). "A Reason To Believe". Sun-Sentinel. Archived from the original on February 1, 2016. Retrieved January 17, 2016. ↑ Mayfield, Geoff (May 8, 1999). "Between the Bullets". Billboard. Retrieved February 6, 2016. ↑ Bego 2001, p. 286. ↑ Jacks, Kelso (April 12, 1999). "Record News". CMJ New Music Report. Retrieved February 6, 2016. ↑ Bego 2001, p. 290. 1 2 "Believe it". Billboard. January 22, 2000. Retrieved January 17, 2016. ↑ Bego 2001, p. 291. ↑ "Sunday's Madonna's Night". Cable World. September 3, 2001. Archived from the original on February 20, 2016. Retrieved February 6, 2016. 1 2 Dezzani, Mark (May 22, 1999). "Smith Leads A More Polished WMAs". Billboard. Retrieved January 17, 2016. ↑ Bego 2001, p. 287. ↑ Berman 2001, pp. 86–87. ↑ Wilker, Deborah (November 14, 2000). "I've Got E, Babe". Chicago Tribune. Archived from the original on November 5, 2012. Retrieved January 17, 2016. 1 2 Flick, Larry (January 12, 2002). "Warner's Cher Offers 'Living Proof'". Billboard. Retrieved January 17, 2016. ↑ "Chart Beat Bonus". Billboard. March 8, 2002. Archived from the original on February 1, 2016. Retrieved January 17, 2016. ↑ "'Divas Las Vegas' Hits DVD/CD". Billboard. September 10, 2002. Archived from the original on January 31, 2016. Retrieved January 17, 2016. ↑ "2002 Billboard Music Awards". Billboard. December 9, 2002. Archived from the original on May 20, 2015. Retrieved January 17, 2016. 1 2 Waddell, Ray (December 7, 2002). "Award Is 'Living Proof' Of Success". Billboard. Retrieved January 17, 2016. ↑ "In pictures: Cher empties wardrobe". BBC News. September 4, 2006. Archived from the original on January 31, 2016. Retrieved January 17, 2016. ↑ Greenblatt, Leah (October 5, 2007). "Retirements that didn't last". Entertainment Weekly. Archived from the original on March 7, 2016. Retrieved January 17, 2016. ↑ Newman, Melinda (January 18, 2003). "The Beat". Billboard. Retrieved January 17, 2016. ↑ "Program summary – Cher: The Farewell Tour". ABC Television. Archived from the original on January 15, 2016. Retrieved January 17, 2016. ↑ "On the road with Cher". Adobe Systems. Archived from the original on December 22, 2015. Retrieved January 17, 2016. ↑ Bonin, Liane (October 31, 2003). "Cher's tour is the most successful ever by a woman". Entertainment Weekly. Archived from the original on April 2, 2016. Retrieved January 17, 2016. ↑ Unterberger, Richie. "Live: The Farewell Tour – Cher – Songs, Reviews, Credits". AllMusic. Archived from the original on February 1, 2016. Retrieved January 17, 2016. ↑ "Numbers". Time. April 21, 2003. Archived from the original on December 22, 2015. Retrieved January 17, 2016. ↑ Hay, Carla (December 27, 2003). "Tuned In: Rating Hits And Misses". Billboard. Retrieved January 17, 2016. ↑ "Cher – The Farewell Tour". Academy of Television Arts & Sciences. Archived from the original on December 22, 2015. Retrieved January 17, 2016. ↑ Newman, Melinda (September 13, 2003). "The Beat: Cher Signs Worldwide Warner Bros. Deal". Billboard. Retrieved January 17, 2016. ↑ "Cher's 'Farewell' Tour Beats On". Billboard. June 9, 2003. Archived from the original on January 31, 2016. Retrieved January 17, 2016. ↑ Caro, Mark (December 12, 2003). "Farrelly brothers' comedy chops come unglued in 'Stuck on You'". Chicago Tribune. Archived from the original on May 5, 2015. Retrieved January 17, 2016. ↑ Lawrence, Jesse (March 23, 2014). "With Strong Demand For Tickets, Will Cher's Dressed To Kill Tour Really Be Farewell?". Forbes. Archived from the original on April 29, 2014. Retrieved January 17, 2016. ↑ Rockman, Lisa (May 8, 2018). "Cher starts Australian tour in Newcastle". 1 2 3 4 5 Smith, Krista (November 30, 2010). "Forever Cher". Vanity Fair. Archived from the original on January 20, 2016. Retrieved January 17, 2016. ↑ "Cher Announces Final Shows of Three Year Residency at The Colosseum at Caesars Palace" (Press release). PR Newswire. September 21, 2010. Archived from the original on February 1, 2016. Retrieved January 17, 2016. ↑ Bernstein, Jacob (July 3, 2013). "Cher Talks About (What Else?) Being Cher". The New York Times. Archived from the original on December 20, 2016. Retrieved January 17, 2016. ↑ Wood, Mikael (November 19, 2010). "Christina Aguilera and Cher Shine on 'Burlesque' Soundtrack". Billboard. Archived from the original on January 25, 2016. Retrieved January 17, 2016. 1 2 Caulfield, Keith (January 18, 2011). "Cher Shines with No. 1 in Sixth Consecutive Decade". Billboard. Archived from the original on February 1, 2016. Retrieved January 17, 2016. 1 2 "Cher Immortalized in Cement". The Advocate. November 19, 2010. Archived from the original on October 6, 2014. ↑ Ebert, Roger (July 6, 2011). "Zookeeper Movie Review & Film Summary (2011)". RogerEbert.com. Archived from the original on January 29, 2016. Retrieved January 17, 2016. 1 2 "Cher to Celebrate Release of New Single 'Woman's World' With Performance on Final Episode of NBC's 'The Voice' on Tuesday, June 18th". Yahoo! Finance. June 10, 2013. Archived from the original on July 21, 2017. ↑ Brodeur, Michael Andor (September 24, 2013). "Album Review: Cher, 'Closer to the Truth'". The Boston Globe. Archived from the original on January 24, 2016. Retrieved January 17, 2016. ↑ Kroll, Katy (October 16, 2013). "'The Voice' Recap: Cher Chews Out Contestant". Rolling Stone. Archived from the original on January 12, 2016. Retrieved January 17, 2016. ↑ Smith, Liz (July 3, 2013). "It's a 'Woman's World' for Cher – and ALL her fans!". Chicago Tribune. Archived from the original on September 28, 2013. Retrieved January 17, 2016. ↑ Oldenburg, Ann (November 5, 2013). "Cher rocks 'Dancing' as sixth celeb exits". USA Today. Archived from the original on October 25, 2016. Retrieved January 17, 2016. 1 2 Caulfield, Keith (July 15, 2014). "Cher Tour Grosses $55 Million (So Far)". Billboard. Archived from the original on January 29, 2016. Retrieved January 17, 2016. ↑ Rocha, Michael James (July 12, 2014). "Pop diva Cher still reigns supreme". The San Diego Union-Tribune. Archived from the original on December 26, 2016. Retrieved January 17, 2016. ↑ Swartz, Diana (November 20, 2014). "Cher Cancels Remaining Tour Dates to Recover". Billboard. Archived from the original on January 31, 2016. Retrieved January 17, 2016. ↑ Newman, Jason (May 7, 2014). "Cher, Wu-Tang Clan Collaborate for Two Songs on Secret Album". Rolling Stone. Archived from the original on December 31, 2015. Retrieved January 17, 2016. ↑ Greenburg, Zack O'Malley (November 24, 2015). "Wu-Tang Clan Secret Album Sold By Paddle8, But To Whom?". Forbes. Archived from the original on January 19, 2018. Retrieved January 17, 2016. ↑ Vanmetre, Elizabeth (May 27, 2015). "Cher looks beautiful in new Marc Jacobs ad". New York Daily News. Archived from the original on January 28, 2016. Retrieved January 17, 2016. 1 2 Schneier, Matthew (May 5, 2015). "At the Met Gala, Cher and Marc Jacobs Make a Dream Duo". The New York Times. Archived from the original on September 27, 2015. Retrieved January 17, 2016. ↑ TV News Desk. "Legendary Superstar Cher Announces Additional 2018 Vegas Dates". Broadwayworld.com. Retrieved 2018-07-14. 1 2 3 Lewis, Hilary (May 21, 2017). "Cher Accepts Icon Award at Billboard Music Awards 2017". The Hollywood Reporter. Archived from the original on August 16, 2017. Retrieved August 15, 2017. ↑ Bamigboye, Baz (October 16, 2017). "Here she goes again: Cher prepares to return to the big screen with appearance in Mamma Mia 2". Daily Mail. Archived from the original on June 24, 2018. Retrieved October 16, 2017. ↑ Olen, Vivian; Harkins, Matt (July 17, 2018). "Cher Should Be in Every Single Movie". New York. ↑ Emily Bruno (December 21, 2017). "Grandma Cher, No Meryl? What We Learned From the MAMMA MIA! 2 Trailer!". Broadwayworld.com. Archived from the original on May 11, 2018. Retrieved June 23, 2018. ↑ Adams, Cameron (March 1, 2018). "Cher on why Trump blocked her on Twitter, hating her age, playing Mardi Gras and her fave emoticon". Herald Sun. Melbourne. Retrieved January 4, 2019. ↑ "Abba say Fernando is Cher's song now". BBC News. July 17, 2018. ↑ Knaus, Christopher (December 30, 2017). "Cher's Sydney Mardi Gras tweet sends fans scrambling for tickets". The Guardian. London. Archived from the original on May 11, 2018. Retrieved June 23, 2018. ↑ "Cher Tickets | Cher Tour Dates & Concerts". Livenation.com.au. Archived from the original on May 9, 2018. Retrieved June 23, 2018. ↑ Neutze, Ben (May 8, 2018). "Cher is bringing her arena tour to Sydney". Time Out Sydney. Archived from the original on May 8, 2018. Retrieved June 23, 2018. ↑ "Cher Adds New Shows To Australian Tour Due To Overwhelming Demand ♫ theMusic.com.au | Australia's Premier Music News & Reviews Website". Themusic.com.au. Retrieved 2018-06-23. ↑ "Cher records album of ABBA covers". The List. July 17, 2018. Retrieved July 17, 2018. ↑ "Cher to Release New Album, Dancing Queen, Next Month". Variety. August 9, 2018. Archived from the original on August 9, 2018. Retrieved August 9, 2018. ↑ Spanos, Brittany (September 28, 2018). "Review: Cher Lovingly Updates ABBA's Hits on Dancing Queen". Rolling Stone. Retrieved September 29, 2018. 1 2 3 "Cher sends ABBA into disco bliss on 'Dancing Queen'". Entertainment Weekly. Retrieved September 28, 2018. ↑ Caulfield, Keith (October 7, 2018). "Cher Ties Solo-Career-Best Rank on Billboard 200 as 'Dancing Queen' Debuts at No. 3". Billboard. Retrieved October 7, 2018. ↑ Oxman, Steven (June 29, 2018). "'Cher Show' Review: Pre-Broadway Run in Chicago Opened June 28". Variety. Retrieved 2018-07-14. ↑ "Tickets Are Now on Sale for The Cher Show on Broadway | Broadway Buzz". Broadway.com. 2018-06-18. Retrieved 2018-07-14. 1 2 "Kennedy Center 2018 Honorees Include Cher and 'Hamilton.' Will President Trump Attend?". The New York Times. July 25, 2018. 1 2 White, Jack (January 29, 2018). "Cher to release a new album of ABBA covers in 2019". Official Charts. 1 2 Sillitoe, Sue; Bell, Matt (February 1999). "Recording Cher's 'Believe'". Sound on Sound. Archived from the original on October 5, 2003. 1 2 Tawa 2005, p. 217. 1 2 Flick, Larry (October 31, 1998). "Cher Wants You To 'Believe' In Pop". Billboard. Retrieved January 17, 2016. ↑ Wieder, Judy (May 2002). "Cher shares". Out. Retrieved March 7, 2016. 1 2 3 Marder, Phill (November 15, 2010). "Rock Hall of Fame would be a lot sunnier with Cher". Goldmine. Archived from the original on February 11, 2016. Retrieved January 18, 2016. ↑ Promis, Jose F. "Not.Com.mercial – Cher – Songs, Reviews, Credits". AllMusic. Archived from the original on February 1, 2016. Retrieved January 18, 2016. 1 2 Hilburn, Robert (August 18, 2002). "Written Off ... Unfairly?". Los Angeles Times. Archived from the original on February 3, 2016. Retrieved January 18, 2016. ↑ Viglione, Joe. "Gypsys, Tramps & Thieves – Cher – Songs, Reviews, Credits". AllMusic. Archived from the original on February 1, 2016. Retrieved January 18, 2016. ↑ Holden, Stephen (December 18, 1997). "Cabaret Review; On Life's Rough-and-Tumble, via Mama's Tender Heart". The New York Times. Archived from the original on March 3, 2016. Retrieved January 18, 2016. ↑ Powers, Ann (July 7, 1999). "Pop Review; Quirky but Real, the Beat Goes On". The New York Times. Archived from the original on March 4, 2016. Retrieved January 18, 2016. ↑ Eder, Bruce. "Half Breed – Cher – Songs, Reviews, Credits". AllMusic. Archived from the original on February 1, 2016. Retrieved January 18, 2016. ↑ Snapes, Laura (September 28, 2018). "Cher: Dancing Queen review – ingenious Abba-dabbling". The Guardian. Retrieved September 28, 2018. 1 2 Simpson 2003, p. 116. ↑ Bego 2001, p. 142. ↑ Farber, Jim (June 14, 1991). "Love Hurts Review". Entertainment Weekly. Archived from the original on November 26, 2015. Retrieved January 18, 2016. ↑ Weingarten, Christopher R. (October 15, 2018). "Flashback: Cher Brings the Future of Pop to 'Top of the Pops' With 'Believe'". Rolling Stone. ↑ Lee, Chris (November 15, 2008). "The (retro) future is his". Los Angeles Times. Archived from the original on January 12, 2016. Retrieved January 18, 2016. ↑ Smith, Kerry L. "Living Proof – Cher – Songs, Reviews, Credits". AllMusic. Archived from the original on February 1, 2016. Retrieved January 18, 2016. ↑ Sendra, Tim. "Closer to the Truth – Cher – Songs, Reviews, Credits". AllMusic. Archived from the original on February 1, 2016. Retrieved January 18, 2016. ↑ Rechtshaffen, Michael (September 13, 2013). "Cher finds 'Truth' in new album". Toronto Sun. Archived from the original on July 29, 2017. Retrieved July 29, 2017. 1 2 Wickens, Barbara (March 6, 1989). "The Cher Effect". Maclean's. ↑ Yarbrough, Jeff (August 20, 1996). "Hollywood lives". The Advocate. Retrieved January 18, 2016. ↑ Tasker 2002, pp. 191–192. 1 2 Negra 2001, pp. 170–171. ↑ Tasker 2002, p. 192. ↑ "The 100 Best Acting Performances by Musicians in Movies". Billboard. October 4, 2018. ↑ "10 Top 10". AFI. Archived from the original on March 3, 2016. Retrieved June 23, 2018. 1 2 3 Tasker 2002, p. 193. ↑ Negra 2001, p. 175. ↑ Sullivan, James (August 5, 2002). "Cher's still a diva to believe in / Farewell Tour takes Oakland crowd on glitzy, sentimental ride". San Francisco Chronicle. Archived from the original on January 31, 2016. Retrieved January 18, 2016. ↑ "The Greatest – Ep. 071 '50 Greatest Women of the Video Era'". VH1. Archived from the original on June 29, 2011. ↑ Flint, Roger (March 1980). "Filming the 'Hell on Wheels' Spot". American Cinematographer. Archived from the original on February 16, 2016. Retrieved January 18, 2016. ↑ Quirk 1991, p. 272. 1 2 Lang, Cady (May 20, 2016). "Cher Birthday: Fashion Evolution". Time. Retrieved May 7, 2017. 1 2 Aminosharei, Nojan. "Influential Women in Music – Influential Musicians". Elle. Archived from the original on December 22, 2015. Retrieved January 18, 2016. ↑ Howard 2014, pp. 125–126. ↑ "Mirror, Mirror". Star Trek. Archived from the original on February 3, 2016. Retrieved February 12, 2016. ↑ "Cloud Minders, The". Star Trek. Archived from the original on February 16, 2016. Retrieved February 12, 2016. ↑ Trier-Bieniek 2014, p. 105. ↑ Chunovic 2000, p. 57. ↑ Johnson, Kristina; Nolan, Cathy; Savaiano, Jacqueline (April 21, 1986). "For Those Who Can Stomach It, the Belly Beautiful Emerges as the Season's Hot New Look". People. Archived from the original on December 26, 2016. Retrieved February 12, 2016. ↑ Bego 2001, p. 77. 1 2 3 4 Givhan, Robin (May 14, 1999). "And the Fashion Award Goes to ... Cher?". Los Angeles Times. Archived from the original on June 18, 2012. Retrieved January 18, 2016. ↑ Satenstein, Liana (May 20, 2016). "All Hail Cher, Queen of the Red Carpet Rebels". Vogue. Archived from the original on May 7, 2017. Retrieved May 10, 2017. 1 2 Fury, Alexander (July 23, 2015). "Cher on the cover of Love magazine: Queen of chiffon and sequins is the ultimate fashion icon". The Independent. Archived from the original on February 18, 2016. Retrieved February 12, 2016. ↑ Ramazanoglu 1993, p. 197. 1 2 Sullivan, Jim (June 2, 1996). "Cher thinks the unthinkable: removing all but one tattoo Gasp: Actress-singer-rebel ponders if it's time for a change, now that tattoos are so popular. She bets that even Bob Dole has one". The Baltimore Sun. Archived from the original on January 15, 2013. Retrieved January 16, 2016. ↑ Bono 1992, p. 237. ↑ Jerome, Jim (May 25, 1998). "Being Cher". People. Archived from the original on December 26, 2016. Retrieved January 17, 2016. ↑ Gundersen, Edna (February 6, 2008). "Cher shares: Life, love, tattoos, politics, paparazzi". USA Today. Retrieved January 16, 2016. ↑ Ullman 2007, p. 165. ↑ "Madonna Tops the List as VH1 Counts Down Music's '100 Sexiest Artists' In Five-Hour, Five Night Special, Premiering September 23–27 at 10:00 P.M. (ET/PT)". PR Newswire. September 19, 2002. Archived from the original on January 26, 2016. Retrieved January 16, 2016. ↑ Wortham, Jenna (January 29, 2016). "There's Only Love and Fear: On Cher's Twitter". The New York Times. Archived from the original on February 9, 2016. Retrieved February 12, 2016. ↑ Heisey, Monica (April 30, 2015). "The brilliance of Cher's Twitter – a jewel in the bizarro crown of the internet". The Guardian. Archived from the original on February 16, 2016. Retrieved February 12, 2016. 1 2 Mapa, Alec (April 15, 2003). "We love you, Auntie Cher". The Advocate. Retrieved January 18, 2016. 1 2 Rogers, Thomas (February 21, 2009). "Where have all the drag queens gone?". Salon. Archived from the original on May 14, 2009. Retrieved January 16, 2016. 1 2 Bernstein 2003, p. 166. ↑ "Memorable Will & Grace guest stars: Cher". Entertainment Weekly. March 30, 2006. Archived from the original on November 4, 2015. Retrieved March 22, 2009. 1 2 3 4 5 6 7 8 "Cher Presents 'Love Sees No Color' Premiere at Los Angeles Fundraiser Party". PR Newswire. November 12, 2007. Archived from the original on January 6, 2016. Retrieved January 18, 2016. ↑ "The Collection of Cher Auction". Julien's Auctions. October 3, 2006. Archived from the original on February 16, 2016. Retrieved February 12, 2016. ↑ Bono, Chastity (August 20, 1996). "Cher – The Advocate interview by Chastity Bono". The Advocate. Retrieved January 18, 2016. 1 2 "Cher, Felipe Diniz and Jean Paul Gaultier Honored at Fifth Annual Inspiration Gala São Paulo". amfAR. April 11, 2015. Archived from the original on January 31, 2016. Retrieved January 18, 2016. ↑ Cheever, Susan (May 17, 1993). "In a Broken Land". People. Archived from the original on December 27, 2016. Retrieved January 18, 2016. ↑ Yaeger, Lynn (January 20, 2016). "In Praise of Cher's Response to the Flint Water Crisis". Vogue. Archived from the original on January 22, 2016. Retrieved January 22, 2016. 1 2 Plumez 2002, p. 182. 1 2 Publishing, Here (May 26, 1998). "Quote, unquote". The Advocate. Retrieved January 18, 2016. 1 2 3 4 Wilker, Deborah (November 1, 2000). "Cher Begs Voters Not to Choose Bush". ABC News. Retrieved January 18, 2016. ↑ "Cher: 'I don't know why anyone would want to be a Republican'". Los Angeles Times. February 6, 2009. Archived from the original on January 13, 2016. Retrieved January 18, 2016. ↑ "Cher called in to comment on her visit to wounded soldiers in Walter Reed Army Hospital". C-SPAN Video Library. October 27, 2003. Archived from the original on April 2, 2016. Retrieved July 21, 2016. ↑ Wolf, Buck; Yeransian, Leslie (June 15, 2006). "Cher Goes to Washington". ABC News. Retrieved January 18, 2016. ↑ "Operation Helmet – Video". C-SPAN Video Library. June 14, 2006. Archived from the original on January 31, 2016. Retrieved January 18, 2016. ↑ Mraz, Steve (July 16, 2006). "Cher: 'I don't have to be for this war to support the troops'". Stars and Stripes. Archived from the original on January 31, 2016. Retrieved January 18, 2016. ↑ Malkin, Marc (October 23, 2008). "Cher Radios It In For Barack Obama". E!. Archived from the original on March 30, 2016. Retrieved January 18, 2016. ↑ "Cher On Finding Love: 'Guys Don't Want To Be Mr. Cher'". Access Hollywood. October 31, 2008. Archived from the original on January 31, 2016. Retrieved January 18, 2016. ↑ Couch, Aaron (November 3, 2012). "Cher, Kathy Griffin Slam Mitt Romney as 'Anti-Women' in PSA (Video)". The Hollywood Reporter. Archived from the original on February 1, 2016. Retrieved January 18, 2016. ↑ Michaels, Sean (September 16, 2013). "Cher: I won't play Winter Olympics due to Russia's anti-gay laws". The Guardian. Archived from the original on January 14, 2016. Retrieved January 18, 2016. ↑ Weiner, Natalie (June 19, 2015). "Cher Takes on Donald Trump on Twitter, Says His Punishment Is 'Being Donald Trump'". Billboard. Archived from the original on February 6, 2016. Retrieved February 12, 2016. ↑ "Everything You Need To Know About The Cher Show Tour Tickets". Forbes. June 17, 2018. Archived from the original on June 17, 2018. Retrieved June 23, 2018. ↑ Marder, Phill (September 13, 2012). "Goldmine Hall of Fame Volume 8 continues wide variety". Goldmine. Archived from the original on March 4, 2016. Retrieved January 18, 2016. ↑ Lynch, Joe (May 18, 2018). "Why Cher Is More Musically Radical Than You Think". Billboard. Retrieved January 4, 2019. ↑ Caulfield, Keith (July 8, 2015). "Cher Reflects on 50 Years on the Billboard Charts: 'I Got You Babe,' 'Believe' & Beyond". Billboard. Archived from the original on May 4, 2016. Retrieved May 2, 2016. 1 2 Miers, Jeff (April 17, 2014). 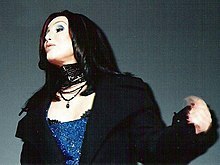 "Tracing Cher's influence among pop divas". The Buffalo News. Archived from the original on December 26, 2016. Retrieved January 18, 2016. ↑ Bego 2001, p. 7. ↑ Ransford, Marc (May 27, 2003). "Professor: Cher is the ultimate pop chameleon". Ball State University. Archived from the original on June 5, 2010. ↑ James, Reed (April 4, 2014). "Before she was an icon, Cher was simply a soul singer". The Boston Globe. Retrieved June 23, 2018. ↑ Carson, Lewis & Shaw 2004, p. 130. 1 2 Crawford 2007, pp. 31–32. ↑ Negra 2001, p. 164. ↑ Negra 2001, p. 170. ↑ Tasker 2002, p. 191. ↑ Parker, Kathleen (July 20, 1988). "Cher As 'Feminist Extraordinaire' Is A Ms.-erable Choice". Orlando Sentinel. Archived from the original on February 1, 2016. Retrieved January 18, 2016. ↑ Dunn, Jancee (September 19, 1996). "Cher". Rolling Stone. Archived from the original on February 2, 2016. Retrieved January 18, 2016. ↑ Bego 2001, p. 3. ↑ "Cher says sorry for eBay 'mistake'". The Daily Telegraph. April 24, 2012. Archived from the original on April 10, 2016. Retrieved June 14, 2016. ↑ Christianson, Emily (February 21, 2013). "EGOTs on deck: Who will win an Emmy, Grammy, Oscar and Tony award next". Los Angeles Times. Archived from the original on January 4, 2016. Retrieved January 18, 2016. ↑ "GRAMMY Hall Of Fame". GRAMMY.com. Archived from the original on January 22, 2011. Retrieved June 23, 2018. ↑ "The Worlds Top Ten | BBC World Service". Bbc.co.uk. Archived from the original on March 30, 2015. Retrieved June 23, 2018. ↑ "Billboard" (PDF). Americanradiohistory.com. June 11, 1988. Retrieved 28 September 2018. ↑ Bronson, Fred (March 13, 1999). "Chart Beat: Did She Or Didn't She? Cher She Did!". Billboard. Retrieved January 18, 2016. ↑ "Greatest of All Time Hot 100 Artists". Billboard. Archived from the original on November 22, 2015. Retrieved January 18, 2016.